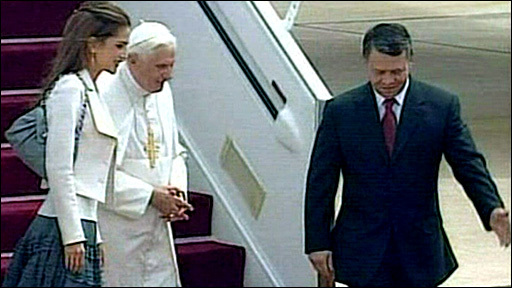 Pope Benedict XVI has arrived at Amman's Queen Alia airport where he has been greeted by King Abdullah II and Queen Rania of Jordan at the beginning of his trip to the Middle East. After Jordan, the Pope's week-long trip takes him to Israel and the West Bank. The visit is aimed at encouraging the minority Christian community in the Middle East, and creating a better dialogue with Muslims and Jews. Jordanian Islamist leaders have demanded that he apologise for a speech in 2006 that linked Islam and violence.